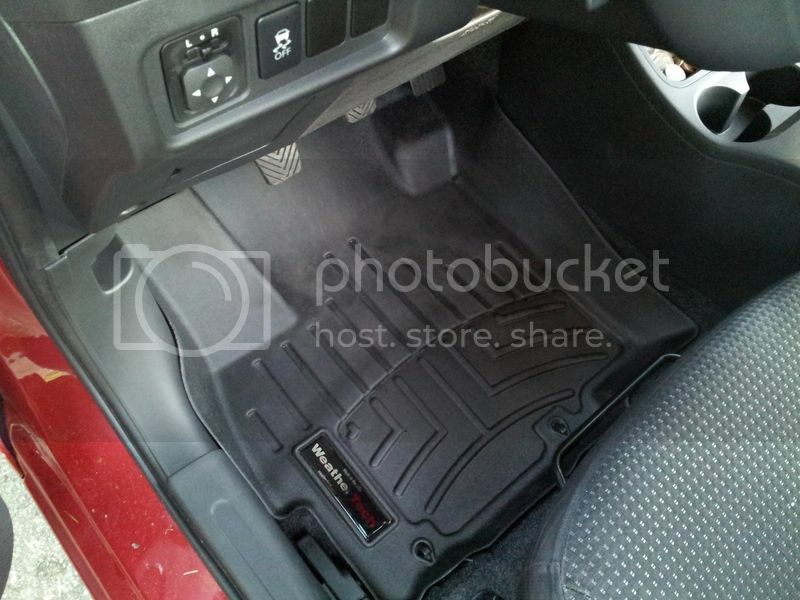 Cheaper Alternative to Weather Tech Floormats? I have noticed one issue with my mirage, my feet are too big for the pedals... maybe it's more of an anatomy issue lol. Anyways, I have noticed the side of my shoe is rubbing the edge of the foot rest carpet area (just to the left of the clutch pedal also known as a dead pedal) when pressing/releasing the clutch pedal. Also, I tend to rest my foot there on the small pad there and it quickly gets filthy. Weather tech makes a laser cut mold which looks like extends up into that area, unlike our crappy stock made mats which stop far short of the pedals, but for the 2 fronts it's $109... $179 for the fronts and rear. A bit more than I want to pay, but I will to save wearing a hole in my carpet. Any suggestions for a cheaper mat that extends into that foot rest pad? I'm afraid if I home make something amd stick it up in there it could get caught up under the clutch pedal which would make it awfully hard to stop. Last edited by TFCfan2021; 11-10-2015 at 02:46 AM. Weather Techs are awesome, and are one of the first things I put in my Mirage. It's awful soggy here in the Seattle area, and rubber slush-type mats are pretty much a necessity if you don't want your car smelling like a locker room in the middle of winter. One downside to the Weather Techs is that the driver's mat doesn't go up far enough to cover the entire dead-pedal area. It covers the bottom 2/3rds or so. Great if you wear size 6, not so great if you wear a size 12. I think these mats are the best thing going, but they are not perfect. Last edited by Cobrajet; 11-10-2015 at 05:50 AM. walmart or sams have these floor mats that have deep grooves on em. I cut the clutch part though so I can press on the clutch all the way. Keeps water and other particles off the floor. Earlier this year we put together a group buy for weather tech floormats. Its not a huge discount, but its something. More info here: Weather Tech floor mat group buy. Post if you're interested. I've got size 13s but I don't use the dead pedal at all. I just rest it on top of the clutch. Bad idea. This will wear out your clutch throwout bearing. Too set in my ways now. I don't put any weight on the pedal anyway, so I disagree. Back when I learned to drive my instructor said it was bad form, though. None of my cars have suffered. I try to keep my foot on the dead pedal sometimes, but my foot ends up staying on the clutch pedal involuntarily! They fit very well. My pic in a post above is these mats installed in my car. I got the OEM all weather mats from Mitsu and they held up great this winter! The dead pedal is covered from top to bottom but not on the side and the knobby part under the gas pedal isn't fully covered but I was very happy with the result compared to last winter when I didn't have all weather mats. Plus, they cost about 2/3 the price of the Weather Techs. Check out my garage for photos.